When I was 20 years old, I went to Hyderabad to learn marketing of Indian handicrafts. However, I fell in love with the weaving of pochampally and developed colour combinations in the woven fabric. Bhumika would send me sketches of garments while she was interning in Bangalore and our first collection was born. Infact, Bhumika’s graduating project of reviving the Amdavadi real zari weaving technique was our first step into conceptualising the brand. We believe in taking ‘India to the World’. The brand stands for stunning craftsmanship and artistry with the regal aesthetic that comes from our lineage. We truly believe it creating heirlooms similar to the ones our ancestors left for us. The modern bride today is much like the Shyamal&Bhumika muse, who is an independent and confident woman. She is elegant and sophisticated, with global exposure and values her roots immensely, regardless of where she lives. She emulates timeless beauty and effortless style. She appreciates the craft done by hand, its uniqueness and rarity. She is keen on absorbing all that the world has to offer, yet creates her own identity interwoven to her roots. The Indian Bride has been a traditionalist all along. With global exposure, she has come to appreciate the workmanship created by Indian artisans and the grandeur attached to it. She today wants to make a deliberate fashion statement and uses western nuances juxtaposed with Indian aesthetics to create her own identity. What are must-haves in a bridal trousseau according to you? A hand woven Amdavadi real zari sari, embroidered clutch, comfortable shoes and polki jewellery are a must have. What fashion trend would you personally love to see make a comeback? Craft by hand is the most important aspect of what we do. Following our love for hand woven fabrics and hand embroidery techniques we would like to see people appreciate the rare art created by artisans. We want more people to start appreciating the uniqueness of natural hand woven fabrics, hand embellishing and also hand finishing that are not present in machine made clothes. We celebrate couture for its exceptional artistry and fine details and treasure the rare beauty it brings to the world of fashion. 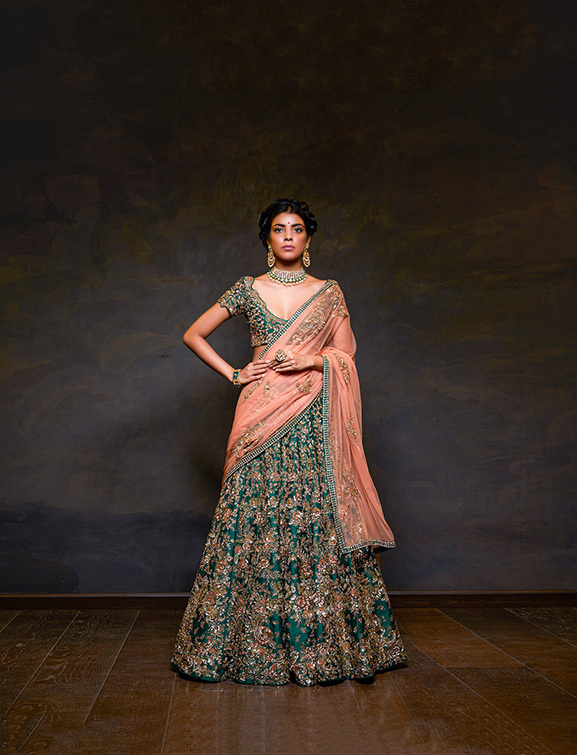 This winter, traditional wedding lehengas and saris, embroidered with age old techniques of aari, zardozi and pitta in tumbling vines, floating flower bouquets, delicately appliquéd petals and gilded vintage crest motifs are trending. The colour palette for this wedding season is a mix of antique pastel shades and jewel colours like English rose pink, ochre, moon grey, dusty mint, muted ivory, champagne, midnight blue, emerald green, indigo blue and crimson reds. In silhouettes, classic gowns and lehengas with sweeping hems are trending this season. Saris are never not-in-fashion. Corsets make a comeback to give gowns and lehengas a modern makeover. The asymmetrical and ruffled flare lehengas with wide shoulder and jacket blouses and constructed draped gowns are in trend for the pre-wedding functions. 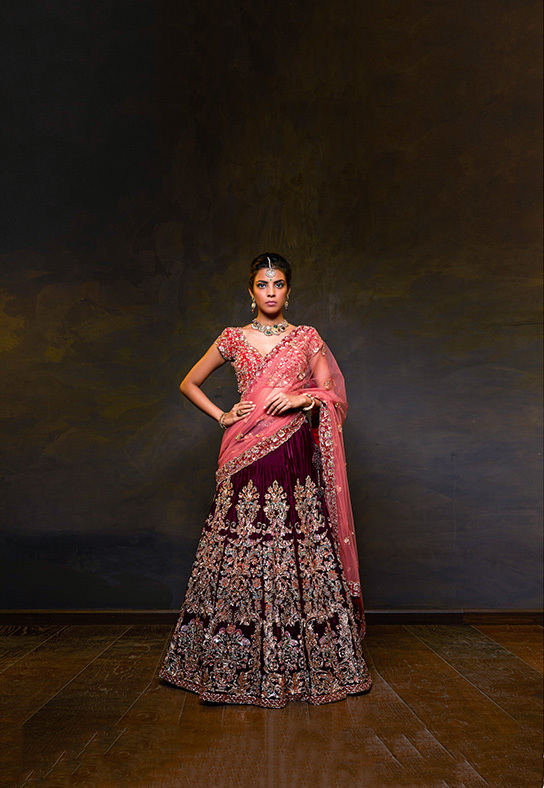 Signature ruffle details in lehenga hems and sari hems bring a delicate touch to the ensembles.